CLAREMORE, OK�SEPTEMBER 10, 2016�DOMINYUN's Jm Texas Dominun got up to win the second of 11 trials contested Saturday for the $303,000 Black Gold 350 Futurity Championship at Will Rogers Downs. His :17.803 clocking was the third fastest of the day. Making his first start since breaking his maiden at Remington Park in May, Jm Texas Dominyun got up over Widows Devil for the second win this season. The lightly raced colt was making only his third start, first since breaking his maiden at Remington in May. 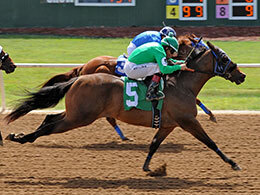 Agustin Silva had the riding call aboard the Texas homebred for owner/breeder Jimmy Maddux. Mollie Devereaux saddled the son of Dominyun out of the Tres Seis mare Texas Lucky Lady. For a complete list of Black Gold 350 Championship Futurity finalists, times, sires, dams, owners, breeders, trainers and jockeys CLICK HERE.